The illustration at right is a photo of the mural painted on our north wall by renowned Kitchener-Waterloo artist Lance Russwurm in September, 1997. 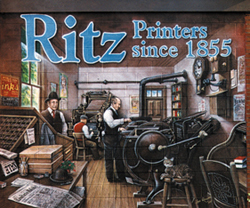 It shows Great Uncle Dan Ritz, Grandfather Otto Ritz at the Linotype and Great-Grandfather Jacob at the hand-fed platen press. We're thrilled with the historical accuracy and detail! We asked Lance for a mural to advertise our business to the traffic moving by on the street. He gave us, instead, a pictorial celebration of our past!